How does a dog look that has heat stroke? He will shake like when having convulsions and can have foamish discharge coming from his mouth. Some of the information provided below comes from Dr Pitcairn Natural health for dogs and cats guide. 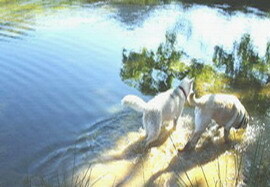 Take the dog into a shaded and cooler area.Make the dog wet with water continuously to cool the body. Use wet towels or ice packs around the dog’s body. Give one dose of Belladonna 30CIf not improving in 30min give a dose of Glonoine 30C. Administer Dr. Bach's rescue remedy; two drops every 10 min in the mouth or on the inside of the ear where there is little hair. If you are at home you can put your dog in a bath and then take ice packs with as well as the a both mentioned and rush to the vet. Back to winter dogs page.